One of the most common questions I get from people when traveling, is to name a few traditional Canadian dishes. For all of the Canadians out there reading this, you know that that isn't always easy. Having been founded by two different countries and not having historically really "broken" away from either country (we're not really known for our revolutions), Canadian cuisine is strongly influenced by traditional British, French and Native dishes. Canada is an extremely young country whose population growth was really only experienced within the last 2 centuries. Given Canada's recent immigration history and the introduction of dishes from around the world, Canada was never truly able to develop a strong sense of traditional quintessential Canadian cuisine. Recipes are passed down from generation to generation and considering the fact that Canada is a beautiful cultural mosaic many traditional Canadian recipes that had been developed in the past, have not been widely shared. There are of course some exceptions; Beaver Tails, Poutine, Dry Meat, Maple Syrup, Butter Tarts, Tourtiere, Canadian Bacon, Apple Pie with Cheddar Cheese etc. So... given that SLICE is a magazine hoping to shine a spotlight on Canada and our culture, I thought we'd start a monthly "Cookin' n Canada" segment, where we'll introduce you to some of Canada's traditional recipes that you can print out and add to your family food diary. First on our list is a staple in highschool cafeterias across Canada. It is the almighty Nanaimo Bar. 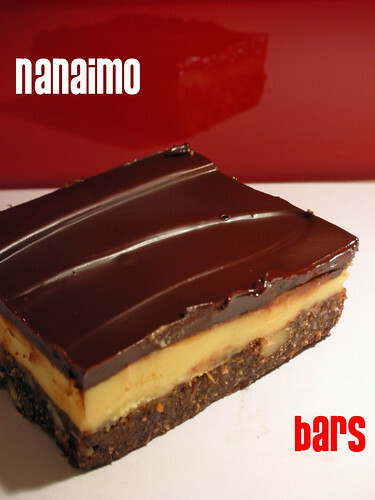 Legend has it that Nanaimo Bars originated in Nanaimo BC in the 1950's. A local housewife submitted the recipe to a newspaper competition and subsequently her recipe was selected, leading to a great deal of publicity. 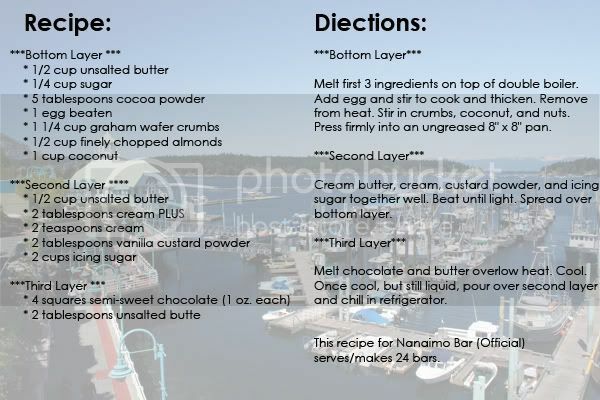 Nanaimo Bars are a non-bake confectionery consisting of 3 layers. Smooth chocolate at the top, light vanilla custard in the middle and graham cracker and coconut at the base. MMMMMMMMMM. I love the "Official" part at the end of the recipe! LOL. Thanks for share, I love that, I'm not a chef but I love to cook, I always try to made something different every weekend.